For any first-year beekeepers in Newfoundland (or a similar climate) wondering what they might find during their first hive inspection of the year (which usually falls somewhere between late April and mid-May), here’s a video of my first hive inspection in 2011 that shows a fairly healthy colony coming out of winter, one that allowed me to steal a boat load of honey from it later that summer (though I may have had to feed it for a few weeks to give it a boost; I don’t remember). I found honey on the outside frames, some pollen mixed in and then capped and open brood spread out over five or six frames in the middle. 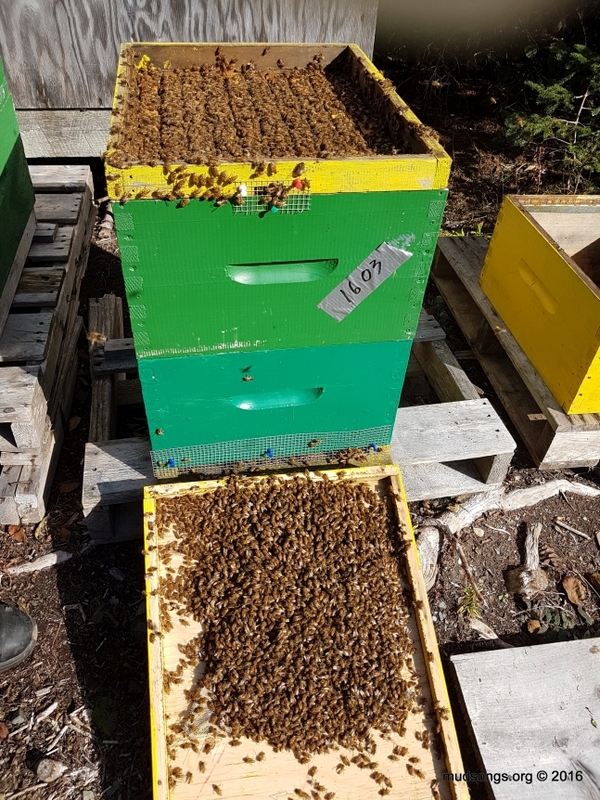 I might have been concerned with one or two frames of brood (though queenright colonies with zero brood as late as May 15th isn’t unheard of) but five or six frames of brood during the first week of May is pretty good for my local climate. (None of my colonies are doing as well this year. They’re still recovering from The Attack of The Shrews.) The hive body underneath was more or less empty. February 2019 Introduction: I makes mistakes all the time, so I feel confident in passing on this pro tip. Here’s my pro tip: After moving a hive to a new spot, remove all signs of the old hive so that any returning bees have no visual cues that their hive was ever there. In other words, don’t do what I did in this video. It’s an enlightening video in that it demonstrates how honey bees summon all their siblings to the location of their new home by fanny pheromones into the air after a major disturbance (which I admit is a very cool thing that honey bees do). But the bees in the video probably would have found the location of their new home much faster and with much less effort if I’d simply removed all signs of their old hive. I should have shaken all the stragglers off the old hive components in front of the new hive. Then I should have removed the old hive stand, the boxes, everything, from the old location, so that nothing that looked like their old hive or smelled like their old hive was there to confuse them. This is part 2 of Inspecting and Moving a Hive. P.S. : I wasn’t wearing any protective clothing during this portion of the video. Not a single sting. Some of the bees became more defensive an hour or so later when plenty of foragers were still coming back to the old spot. I was probably messing up the orientation pheromones with my stinky human smell.